On our third day running around the mountains, the heat of April in Taiwan heavy on our brows, Brother Liu ordered us a chicken. We had one more night in Nantou County, and he wanted to send us off with a special meal. Nantou is a lush, hilly county in the center of the island, its rural areas home to scenic vistas for traveling hikers and thousands of acres of tea plantations. Liu is a farmer at one of those plantations, and my friend Theresa Wong, who runs a New York City boutique called T Shop, is one of his customers. She was in town to check on the new harvest and do some business. For Liu, the trip might as well have been an official state visit. The thing to know about Nantou is that there’s no such thing as overdoing it with guests. For days we were fed, toasted as an honored delegation, fed some more, introduced to all the machers about town, and force-fed pork buns at the night market. On our final evening, as the sun sank below the misty peaks of the surrounding mountains, we piled into Liu’s Jeep with his wife and kids for a drive. The other thing to know about Nantou is the roads are lined with chicken. What barbecue joints are to the Carolinas, roast chicken restaurants are to Taiwan’s tourism destinations. Liu reserved a chicken in advance because we were on the way to Provincial Urn Cylinder Chicken, a particularly good spot in Lugu Township that, in 2013, beat more than 50 other local restaurants to win an award best translated as the Super Tyrant Chicken Throne. 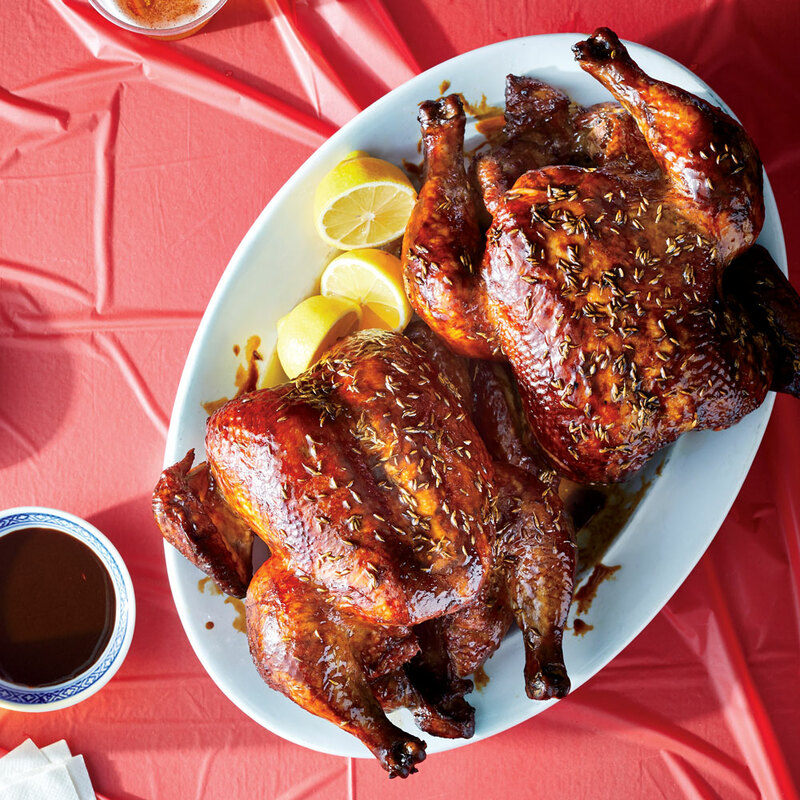 Weng yao ji, or clay oven–roasted chicken, is country cooking at its best. You take a young chicken, preferably one that was squawking around a field a few days ago, and marinate it in a ginger-soy brine. Then you hang it upright in a tandoor-like oven to roast slowly over logs of fruity longan wood. When the meat’s cooked through, you sling the bird over to a hotter oven, this one about 800°F, to turn the skin mahogany crisp. The only utensils needed for weng yao ji are plastic gloves. After presenting your dinner to you whole, the chicken master (or the server, depending on the restaurant) rips the creature apart limb from limb, anoints it with its flame-licked drippings, and submits it for you to devour. taurant, a feast was waiting: purple yam noodles and two kinds of bamboo and wild greens laced with red chile and tiny salted fish. The chicken master gave us a peek at his ring of clay ovens, each smoking several birds at a time, before retrieving the centerpiece of our dinner and baptizing it in schmaltz. What is it about eating barbecue with your hands that makes the meat taste so much better? Maybe it’s the heretic’s version of an animal sacrifice, where a group of friends honors one another by sharing the dismembered flesh of something else. Or it could just be practical. The juiciest bites of chicken are closest to the bone and hemmed in by fibers that render a knife clumsy. We donned our plastic gloves and set to work. Every weng yao ji restaurant prepares their chicken differently, making the dish their own through custom spice blends or marinades. But the core of it—the chicken itself—is elemental and has nothing to do with technique. I could tell you the bird tasted good, exceptionally juicy and delicately fragrant with longan smoke. I could even describe the expertly roasted skin, shatter-crisp in some spots, snappy in others, and the flavorful fat it smeared on my lips and cheeks. It’s all true, but it’s not the whole story. You have to put yourself there, sitting on the mountaintop at dusk, gnawing at chicken bones and a whole ecosystem’s worth of plants the bird lived with. The meal is an embodiment of where you are, the taste of life all around you. We’d been chatting all day, but at dinner we fell silent. There was chicken to eat, and all we had to say we could communicate with grunts and smiles. Once we nibbled the bones clean and slurped our last noodles, we ambled out for a postprandial stroll. Theresa and Liu turned to matters of tea-growing arcana, so I followed the kids to chase a swarm of fireflies down a dirt path. We didn’t catch any, but before the insects flew away, the faint beads of their light twinkled in the sheen of chicken fat on our lips. From the capital city of Taipei, head south to Taichung City, an hour-long trip via Taiwan’s high-speed rail, THSR. From the Taichung THSR station, you can transfer to buses that drive tourists to mountain destinations like Lugu Township and hiking ranges like the Shanlinxi Forest Recreation Area. You can stay at a resort, like the family-friendly Xitou Monster Village, a Japanese-style village inhabited by monster statues and costumed performers. It’s actually really cute, and they sell tasty bamboo-charcoal soft serve. But the best places are little family-run inns, where a night’s stay can cost as little as $20 and usually includes a breakfast of congee.